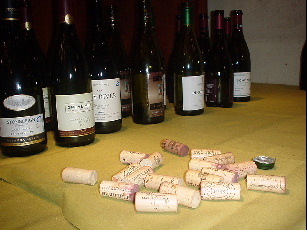 The Tokyo Wine Society is a group of wine enthusiasts that does monthly blind wine tastings open to the public. Anyone who is interested can attend the tastings (although reservations are required). There are a number of regulars and a periphery of people who come from time to time. About 150 people are invited each month. The usual attendance is about 30 people (32 is the limit). The group is about half foreigners and half Japanese. Most of the Japanese people attending speak good English. Tastings always include dinner. They are held at a number of different restaurants around Tokyo, starting at 7:00. Tastings range from ¥11,000 to ¥13,000 including the dinner, of course. Each month nine wines (occasionally more) are compared blind. Usually they are variations on a theme. Often an oddball is thrown in for contrast. Note that there is now an ¥8,000 cancellation fee if you reserve a space and do not appear. There is no fee if you cancel by noon on the day before the tasting. The people who attend range in experience from veteran wine enthusiasts to curious beginners. 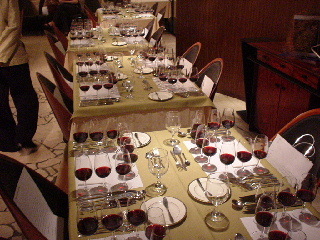 At each tasting nine related wines are served blind. Tasters are asked only to rank them in order of their own preference. The group is not at all snobbish. We do not encourage people to guess what is what. The aim is to provide an opportunity to compare wines without prejudice. At the end of each tasting the President announces how the group ranked the wines in terms of pleasure and the identity of each of the wines is announced. This form mail will put you on the e-mail notification list. After you receive notification of an upcoming tasting, all you have to do is returm the e-mail if you want to attend. First come, first served. Please do not say you will attend unless you are certain you will be able to. Not appearing is unfair to people on the waiting list and to the restaurants preparing food. Please arrive on time for tastings. Note that there is now an ¥ 3,000 cancellation fee if you reserve a space and do not appear. There is no fee if you cancel by noon on the day before the tasting. Thanks for your understanding.